The word “superfood” is defined as a nutrient-rich food considered especially beneficial for health and well-being! Flax Seeds – Flaxseeds contain lignans, omega-3 fatty acids, protein, and fiber. Adding them to your diet can help your heart health, digestive system, and may even reduce inflammation associated with arthritis. Chia Seeds – Chia seeds are a complete protein rich in fiber, potassium, calcium, iron, phosphorus and manganese. It is also very rich in vitamin C, omega 3 and 6 and antioxidants. 10g of fiber and 5g of protein per ounce! Pumpkin Seeds – High in protein and a slew of minerals, including copper, magnesium, manganese and phosphorous, and zinc! Hemp Seeds – Hemp seeds are filled with essential fatty acids and protein. A good source of magnesium, zinc, iron, potassium, calcium and phosphorus, which are all necessary for normal body function and development. Sesame Seeds – High in protein and fiber – which is good for digestion. High in: zinc – which improves immune health and skin elasticity; copper – which we need for energy; manganese – which supports bone health! Also a good source of calcium, magnesium and iron! Raspberries – Raspberries are the main berry source of ellagitannins, a type of antioxidant that may have anticancer effects. Also a good source of Vitamin K and fiber! Blackberries – Blackberries get their brilliant color from powerful anthocyanins, which are responsible for healthy memory function, anti-aging and reducing the risk of certain types of cancer. Strawberries – The star player in strawberries is vitamin C, which helps build and repair the body’s tissues and boosts immunity! Also found to promote healthy eye function, inhibit wrinkle formation & reduce cholesterol! Blueberries – Research shows blueberries can help boost brain power and reduce age related symptoms! Dates – High in dietary fiber, as well as potassium, calcium, iron, phosphorous, manganese, copper and magnesium! Oranges – They contain high concentrations of vitamin C, vitamin A, antioxidants, flavonoids, potassium, calcium, magnesium, dietary fiber and has been found to help preventing many cancers. Cherries – Antioxidants called anthocyanins give cherries their crimson color, which have a natural anti-inflammatory effect. Also contains melatonin which can improve sleep quality and potassium which can lower blood pressure. Plums – High levels of antioxidants. Studies suggest they can fight obesity! Cranberry – Cranberries have been shown to improve oral health, fight urinary infections, exert anti-cancer effects, and boost the immune system! Grapes – Packed with hundreds of antioxidants, including vitamins C and K and beta-carotene! Antioxidants act as free radical hunters to prevent and repair the damage to cells. Also found to be great for your skin and heart! Goji Berries – Rich in antioxidant! A complete source of protein and amino acids; contains lots of trace mineral as well as vit B1, B2, B6, E and C. They are also well-known to improve vision, boost libido and immune system! Avocado – Loaded with a wide range of nutrients and beneficial phytochemicals such as carotenoids, fiber, folate, glutathione and monounsaturated fatty acids. Watermelon – Studies suggest watermelon could potentially lower blood pressure and reduce the risk of cardiovascular disease. And the lycopene in watermelon could help protect the body from UV rays and cancer. Figs – The health benefits of figs come from the presence of minerals, vitamins and fiber contained in the fruit. Figs contain a wealth of beneficial nutrients, including vitamin A, vitamin B1, vitamin B2, calcium, iron, phosphorus, manganese, sodium, potassium and chlorine. Cardamom – Cardamom is one of the richest sources of the phytochemical cineole, which is the secret to its health benefits. It can be used to fight off sore throats while breaking up chest congestion, making it a remedy for bronchitis, laryngitis and any type of upper-respiratory infection. Pears – Pears are anti-inflammatory, high in fiber, and contain potentially anti-cancer phytonutrients, like cinnamic acid, to guard against carcinogens and keep you disease-free. Associated with preventing type 2 diabetes. Carob – While carob may taste like chocolate, it does not contain some of chocolate’s less appealing health attributes. Carob contains vitamins A, B, B2, B3 and D, and it is also a good source of protein! It is also an excellent source of calcium, said to contain more than 3 times as much calcium as milk. Apples – Antioxidant and nutrient dense! Have been associated with reduced risk of cardiovascular disease, certain cancers, diabetes, and asthma. Pineapple – Known for its anti-inflammatory benefits, as well as a great source for fiber, Vitamin C! Can be high in sugar, so eat in moderation! Kiwi – Great source for vitamin C, which is important for the growth and repair of tissues in every part of the body. Also contain potassium and fiber! Apricots – They are very high in beta-carotene as well as lycopene, which aid in reducing your risk of cardiovascular diseases. Also high in fiber, as well as a good source of vitamin A, C, and potassium. Bananas – Bananas contain significant amounts of vitamins C and B6, are rich in carotenoids, as well as potassium and fiber! Passion Fruit – Rich in polyphenolic compounds such as piceatannol and scirpusin B, and they deliver plenty of insoluble dietary fiber and magnesium. Açaí Berries – Best known for it’s antioxidant and anti-inflammatory properties! Inca Berries – Incan berries are packed with vitamins C and A, iron, niacin, and phosphorous. They’re also high in protein and fiber! Peaches – Loaded with potassium, beta-carotene and antioxidants – which helps to prevent heart problems and low blood pressure, reduce the risk of certain cancers, and are good for your eyes and skin! Papaya – Rich source of antioxidants, phytonutrients, vitamins and minerals! Mango – Rich in fiber, vitamin A – which helps immune function, gum and tooth health, and Vitamin A, which helps eye, skin and bone health! Beets – This all-star veggie contains tons of vitamins, minerals, and antioxidants that can help fight disease and strengthen vital organs. Some studies suggest betalains, the purple pigments in these veggies, may help ward off cancer and other degenerative diseases! Pumpkin – High in beta-carotene, which is known for its immune-boosting powers! Also a good source of fiber, protein and Vitamin K! Cantaloupe – Great source of Vitamin A which promote healthy skin! Also a great source of Vitamin C which can help with cancer, cardiovascular disease, cataracts, and the common cold! Honeydew – Like many types of melons, honeydew contains high amounts of Vitamin A and C. Also a great source of potassium and zeaxanthin, which is a unique component which is associated with protecting vision! Bitter Melon – Bitter melon is particularly rich invitamin A, vitamin C and folate, as well as potassium: a mineral vital to kidney health. Grapefruit – Great source of Vitamin C, A, B-6, potassium and fiber! Studies have suggested eating grapefruit may help you lose weight! Guava – Low in calories but very high in antioxidants and vitamins! A good source of Vitamin C, A, copper, manganese and folate, and even fiber! Ugli Fruit – A cross between a grapefruit and tangerines, this fruit is very nutritious and contains high levels of Vitamin C! Mandarin Oranges – High in Vitamin C, fiber and antioxidants! Could protect against heart attacks, diabetes and stroke as well as staving off obesity! 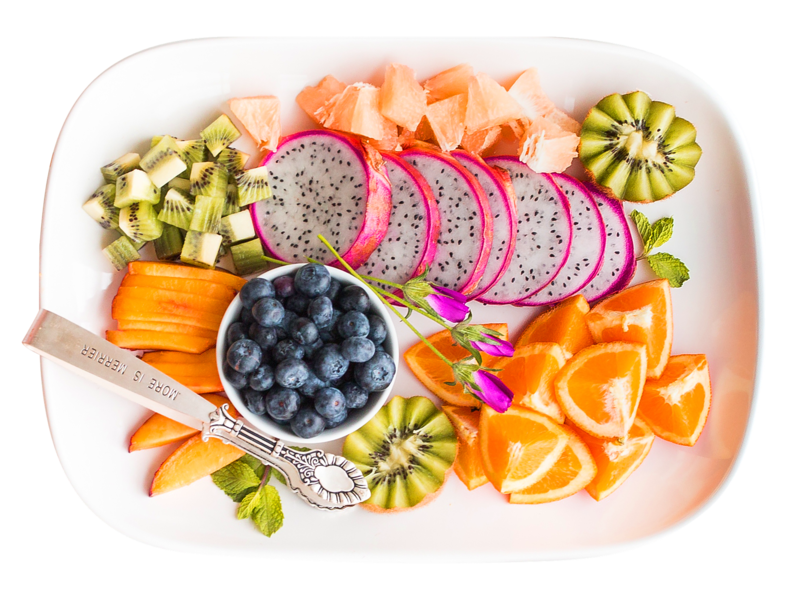 Dragon Fruit – This beautiful kiwi like fruit helps fight disease due to it’s phyto-nutrient density! Also packed with antioxidants which helps keep your skin looking young! Tomatoes – They’re low in fat, high in fibre and a low-calorie source of many vitamins and minerals! Also packed with lycopene, an antioxidant which may protect against cancers of the prostate,lung, colon, oesophagus, and skin. Carrots – Loaded with nutrients and phytochemicals which can offer many health benefits. High in beta-carotene,but low in calories and glycemic index! Cucumber – Known as the everyday superfood, cucumbers are rich in vitamin B5, fisetin, vitamin C, vitamin K, potassium, magnesium, manganese, silica, and fiber, and can help your body eliminate toxins! Jalapeño Peppers – Jalapeños are a source of capsaicin, a compound that’s credited with speeding up metabolism and suppressing appetite! This magical compound can also increases fat oxidation! Red Bell Peppers – A source of two key antioxidants, beta-carotene and lycopene, which are associated with good eye health! While low in fat and calories, they are also a great source of Vitamin C! Yams – Low on the glycemic index, and a great source of fiber, vitamin B6, potassium, and manganese, which help in the production of serotonin, nervous system function, and wound healing! Brussel Sprouts – Excellent source for Vitamin K and C. Also a good source for folate, manganese, fiber and vitamin B6. Associated with lowering cholesterol, cancer prevention and improved thyroid function. Bok Choy – Very low in calories but high in nutrients with many health benefits! High in beta-carotene, two other valuable carotenoids – lutein and zeaxanthin, and Vitamin C and K and other vitamins and antioxidants! Spinach – High levels of antioxidants, anti-inflammatory nutrients, vitamin A – which promotes vision and skin health, & calcium – promoting bone health! Zucchini – Low in calories but packed with vitamins C and B6, potassium, manganese, and folate! Collard Greens – High in nutrients like Vitamin A, zeaxanthin and lutein, which keep your eyes healthy. Also associated with reducing cholesterol! Asparagus – Low in calories, but a great source of vitamin K, which is important for strong bones and blood clotting, and antioxidants and folate! Artichokes – High in antioxidants, fiber and potassium. The potential health benefits of artichokes range from detoxifying and liver-cleansing effects to cholesterol-lowering properties. Cauliflower – Associated with reduced risk of stroke. It also has a healthy dose of antioxidants, vitamin C, vitamin K and fiber, but very few calories! Broccoli – High in fiber, and exceptionally high levels of vitamin C and folate, which can reduce the risk of heart disease, certain cancers, and stroke. Beet Greens – Very nutritious and high in fiber, which has been associated with a reduced risk of cardiovascular disease! Chard – Research has shown that chard contains at least 13 different polyphenol antioxidants, including anthocyanins–anti-inflammatory compounds that could offer protection from type 2 diabetes. Watercress – Very high in beta carotene and vitamin K – two compounds that keep skin dewy and youthful. It is also the richest dietary source of phenylethyl isothiocyanate, which research suggests can fight cancer. Mustard Greens – Contain unique nutrients called glucosinolates, known to break down into a cancer-fighting compounds called isothiocyanates. Kale – The largest amount of antioxidants of any other fruit or veggie! Also a great low-calorie source of fiber, calcium, and iron. Packed with vitamins K, A, and C, plus carotenoids, flavonoids, and isothiocyanates, which have been found to decrease cancer risk. Chinese Cabbage – Rich sources of highly-available calcium and iron, cruciferous vegetables like the cabbage have the powerful ability to “turn off” inflammation markers thought to promote heart disease! Basil – Basil is believed to have anti-inflammatory properties from its oil eugenol, which can block enzymes in the body that cause swelling! Oregano – A good source of omega-3 fatty acids, which are essential for heart health! It may also help combat some types of cancer cells. Rosemary – Rosemary is rich in carnosic acid, an antioxidant that may help limit weight gain and improve cholesterol levels! Chives – This herb is filled with antioxidants, vitamins A and C, and phytochemicals, which have antioxidant-like benefits! Romaine Lettuce – Romaine lettuce packs high levels of folic acid, a water-soluble form of Vitamin B that’s proven to boost male fertility. Also has been found to play a role in battling depression! Parsley – Packed with nutrients! Studies suggest it helps control appetite! Leaf Lettuce – Two cups of lettuce provide 100 percent of your daily vitamin K requirement for strong, healthy bones. Also associated with weight loss! Chicory – It’s one of the best dietary sources of polyphenols – powerful micronutrients that serve a role in preventing disease. Arugula – Studies have associated arugula with more energy, disease prevention and a healthier appearance! Low in calories and fat, but a great source of Vitamin A, C, K, many B vitamins & antioxidant phytochemicals! Cilantro – Very dense in phytonutrients, which can lower blood sugar, increase insulin production, and decrease cholesterol levels. A source of magnesium and iron, with an ability to cleanse your body of toxic metals. Leeks – Low in calories but high in Vitamin A and K, folate and manganese. These help maintain healthy skin, teeth, eyes and heart! Lemongrass – Studies suggest that lemongrass can have anti-inflammatory powers that reduce swelling and help with fluid balance in the body! Seaweed – High in calcium, antioxidants and has been associated with blood purifying and alkalizing properties, and linked to boosting weight loss! Mushrooms – Low in carbs, no fat and no cholesterol, and high in fiber. They are a good source of B-vitamins, iron, selenium and potassium! Garlic – Garlic can help in treating high blood pressure, high cholesterol, heart disease, and heart attack to certain types of cancer! Low in calories but good source of vitamins C and B6, and manganese, & antioxidants! Cacao – Raw cacao can improve your memory, increase your bliss, reduce heart disease, shed fat, boost immunity, and create loads of energy. Very high in antioxidants, iron, magnesium and calcium! Chestnuts – An easy way to get your daily dose of fiber and vitamin E. Containing both soluble and insoluble fiber, chestnuts can help lower cholesterol and reduce the risk for colon cancer while normalizing bowels. Almonds – Very nutritionallydense, and are a good source of potassium, calcium, vitamin E, magnesium, phosphorous, and iron. Studies have shown they can also reduce cholesterol and blood pressure. Enjoy in moderation! Walnuts – Great source of omega-three fats! Can protect against heart disease and help naturally lower LDL (“bad”) cholesterol. Brazil Nuts – A great source of amino acids, fiber and protein! Pistachios – Pistachios are a naturally cholesterol-free snack that’s high in fiber and protein! High in potassium and antioxidants! Enjoy in moderation. Sunflower Seeds – Great source of alpha-tocopherol, the most active form of vitamin E, a powerful antioxidant that protects cells from free radicals and UV damage. Grape seeds – May be surprising, but grape seeds are completely edible, and packed with essential fatty acids, amino acids, & powerful flavonoids! Can be good for leg swelling, varicose veins, and cardiovascular problems. Lentils – Lentils are high in protein, fiber and other essential nutrients,including folate, iron, potassium, and antioxidants! Has a low glycemic index and has been associated with reducing cholesterol and controlling appetite! Steel cut oats – Packed with essential vitamins, minerals, nutrients, and antioxidants, oats are high-fiber morning meal that’s shown to help lower blood cholesterol levels, aid with digestion, and improve metabolism! Quinoa – Protein packed superfood, which provides the nine essential amino acids our bodies can’t produce themselves! Also high in fiber, iron, magnesium, and manganese. Olives – Contains antioxidants which help lower cholesterol! Associated with weight loss and cancer prevention! Can contribute to skin and hair health! Beans – Beans are loaded with fiber, folate, and magnesium, and studies have shown they can help lower cholesterol and reduce the risk of certain cancers. Also a great source of iron, and of protein! Ginger – Studies suggest ginger can reduce nausea and vomiting caused by morning sickness. It can also potentially help alleviate symptoms of arthritis. Lemons – Lemon juice is very low in calories, but high in Vitamin C and antioxidants! These can help fight off colds, decrease heart disease risk, reduce inflammation, and fight some cancers! Green Tea – A good source of antioxidants & their cousins phytochemicals! Sweet potatoes – They are chock-full of disease-preventing, cancer-fighting, and immune-boosting benefits. Sweet potatoes are also good sources of the anti-inflammatory nutrients, vitamins A and C! Cinnamon – Low in calories and has been associated with helping treat diabetes, fighting inflammation and killing bacteria! Turmeric – Turmeric has anti-inflammatory properties and gets its super powers from an antioxidant called curcumin. Wheatgrass – It contains all nine essential amino acids and is loaded with chlorophyll, vitamins, and minerals, offering a host of health benefits! These spreads are out of this world and are full of these superfoods. Their spreads contain only a handful of ingredients, all of which are widely considered to be superfoods! Our combination of these ingredients make the spreads delicious too! They are naturally energizing and a guilt-free snack! The spreads are plant based, paleo, and do not contain preservatives, gluten, dairy, nuts, or refined sugar. They are on a mission to introduce them to kids across the country, as they are a great nutritious alternative to many other spreads! Spread them on breads and your kids’ sandwiches, use as dips or a nutritious topping on roasted vegetables, fruits, oatmeal, smoothies, or you can just eat it the way we do, straight from the jar!